When someone goes to a day spa, they expect to choose from a menu of massages and other treatments to ease tension and soften the spirit. They expect a soothing environment to help them unwind and relax. And they expect to leave feeling rejuvenated, ready to take on the world. Le Rêve Rittenhouse Day Spa in Philadelphia certainly offers all of these charms, but make no mistake: Le Rêve is a day spa of a much different sort. Clients experience the difference the moment they enter this stunning Rittenhouse oasis. They see it in the exquisite detail work of the reception area, highlighted by the soothing décor, which includes a crystal chandelier and an onyx reception desk. They smell it in the soothing aromas that waft through the hallways. They sense it in the soft colors, dim lighting and other elemental touches that add character and comfort to the individual spa suites. And they feel it in the restorative energy that quite literally radiates from the spa walls. When Sophia Brodsky founded Le Rêve, she wanted to create a place of healing, one that enriches a client’s life and enhances their holistic health, both inside and out. Of course, Le Rêve does offer the full gamut of luxurious spa treatments for singles and couples alike. These include facials, massage therapy and aromatherapy, as well as pampering services such as manicures, pedicures and makeup applications. Even so, Le Rêve offers each treatment in way designed to leave clients feeling centered and restored. For example, as part of a spa package, clients may choose to “detoxify” in the breathtakingly designed Himalayan Salt Organic Energy Lounge. This quiet, earth-toned room features Himalayan salt blocks from Pakistan that create a soothing atmosphere in which clients can feel the stress exiting their bodies, from head to toe. With its heated floor and gentle lighting, Brodsky says clients often remark on the peaceful feel of the lounge. Likewise, many clients say they leave the lounge feeling not only more relaxed but also refreshed. That’s because the negatively charged ions in the salt have the potential to enhance mood and energy, Brodsky says, and the particles may actually help to improve one’s respiratory health. Besides the lineup of traditional massages and facials, Le Rêve offers a number of unique treatments designed to restore balance and heal the body. 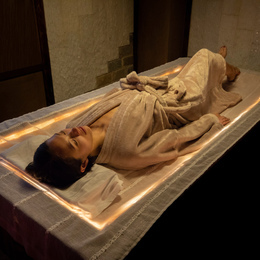 One of the best examples is Himalayan Salt Therapy, whereby clients lay on a heated bed lined with Himalayan salt crystals that can help to reduce inflammation and regulate metabolic functions. Brodsky says the therapy can also play a role in helping clients to recover from injuries, combat fatigue and ward off depression. In addition, Le Rêve recently added a new state-of-the-art anti-aging system designed to refresh the facial skin through treatments such as microdermabrasion and microneedling. Known as the “wrinkle eraser,” the anti-aging system was created by a German manufacturer that specializes in restoring facial beauty. Brodsky says the system can reverse the signs of aging by reducing fine lines and wrinkles, and stimulating the growth of new collagen to provide “a lifting effect.” Clients may see a significant difference in as little as a few treatments. In her heart, Brodsky sees Le Rêve as a place where people make connections. The spa even offers a romantic late-night package for couples, for those who are celebrating an anniversary, a special event or “just because.” As couples arrive at 7 p.m., they are greeted by serene sounds, aromas and experiences, including detoxifying water, before moving on to the spa services of their choice. After the services are complete, the couple can relax in the wet or dry sauna, sipping wine or champagne and nibbling on gourmet chocolates. Brodsky welcomes prospective clients—single, couples, groups—to experience the difference for themselves.